In this blawg, our criminal lawyers explain DWI charges, DWI penalties and DWI consequences. Being accused of driving under the influence of alcohol, marijuana, or any controlled substance in New York is not a matter to be taken lightly. A conviction for any DWI-related offense can have serious consequences, such as incurring a permanent criminal record, driver’s license suspension and/or revocation, payment of hefty fines, enrollment in counseling programs, requirement of the use of an ignition interlock mechanism, vehicle forfeiture, and/or incarceration. In fact, merely being charged with a DWI-related offense can impose a hardship upon a person before he/she is even convicted, as certain Vehicle and Traffic Law (“VTL”) provisions provide for immediate suspension of driver’s licenses which can disrupt a working person’s life. This post will explain the most commonly used DWI charges and the penalties associated with them so that you know what to expect if you or someone you know are in the position of facing a prosecution for DWI. The basic component or “elements” of alcohol and drug related driving offenses are the following: (a) operation of a motor vehicle or vessel, (b) on a public highway or the waters of the State, (c) while in an impaired or intoxicated condition at the time of such operation, (d) due to the voluntary consumption of alcohol or drugs. You might be surprised to learn that a person is deemed to “operate” a motor vehicle if he/she is behind the wheel while the engine is running. As such, there is no requirement that the person charged be observed “driving” the vehicle in the traditional sense that the vehicle be observed in motion. The law is clear that “operation” of a motor vehicle is established where there is a “present intention” of placing the vehicle in operation. Courts have found that people who are asleep at the wheel of a parked car with a key in the ignition and the engine running “operated” a vehicle for purposes of a DWI charge. In fact, courts have upheld convictions where drivers were asleep or unconscious at the wheel of vehicles which were parked in their own driveways as they were deemed to have operated a vehicle on a “public highway” – public highway including highways, private roads open to motor vehicle traffic, parking lots, and even driveways to residences. Many people who are arrested for and accused of DWI in New York need to be able to use their car to get to work on a daily basis. 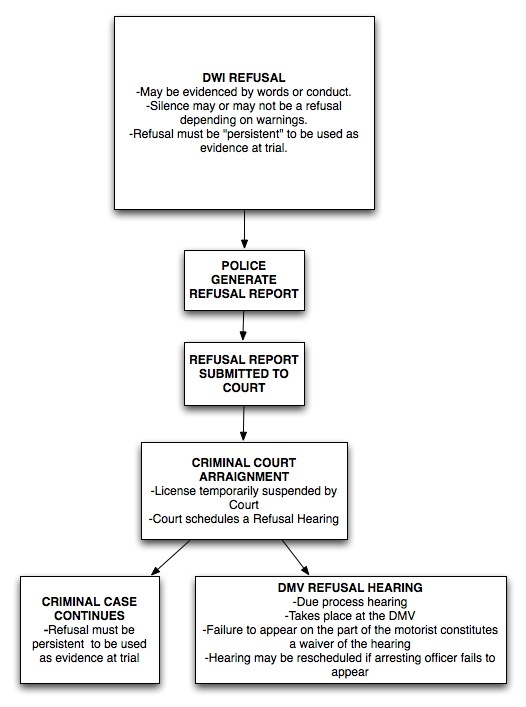 Unfortunately for those people, New York law generally requires the immediate suspension of an arrestee’s driver’s license which lasts until the end of the prosecution, at which time the suspension either goes away (in the case of an acquittal or dismissal) or becomes set for a fixed period of time. On June 14, 2004, night club owner Neville Wells struck with his vehicle and and killed 37-year-old Judith Gubernikoff on Manhattan’s Lower East Side. A grand jury charged him with one count of murder in the second degree and assault in the first degree (both under depraved indifference theories), and one count each of vehicular manslaughter in the second degree, vehicular assault in the second degree, and assault in the second degree. The defendant “benched” the case and a trial was held without a jury before the Hon. Richard Carruthers beginning on May 3, 2005. According to the trial transcript, Wells blew through a red light and hit the vehicle in which Ms. Gubernikoff and her father were riding. Eyewitnesses stated that Wells was driving very fast at the time of the accident, completely disregarded the semaphore in the intersection, and was completely incoherent immediately after the accident. In fact, Wells’ blood alcohol content at the time he was tested shortly after the accident was between .25% and .27%, which is more than three times the legal limit. After trial, Wells was convicted of Murder in the Second Degree under a “depraved indifference” theory and sentenced by the judge to concurrent indeterminate prison terms of from seventeen years to life. Wells appealed his conviction directly to the Supreme Court, Appellate Division, First Department, arguing that “that the evidence [was] insufficient to sustain conviction of murder in the second degree and assault in the second degree because it failed to establish that his conduct was so morally deficient and devoid of concern for life as to warrant exposing him to the same criminal liability that the law imposes for intentional conduct.” See People v. Wells, 53 A.D. 3d 181 (1st Dep’t 2008). Additionally, before his appeal was decided in the intermediate appellate court, New York’s highest court, the Court of Appeals, decided People v. Feingold, 7 N.Y.3d 288 (2006), which overturned People v. Register 60 N.Y.2d 270 (1983). After Feingold, the standard for depraved indifference crimes to require courts to look at the mental state from a subjective point of view, finding guilty only where the particular defendant demonstrates “‘a willingness to act not because [he] intends harm, but because [he] simply doesn’t care whether grievous harm results or not . . . . A defendant must possess an “utter disregard for the value of human life . . . embodied in conduct that is so wanton, so deficient in a moral sense of concern, and so blameworthy as to render the actor as culpable as one’ who intends the result of his acts.” Wells v. Perez, 10 Civ. 1107 (S.D.N.Y. 2010) (Report and Recommendation of Francis IV, J.). 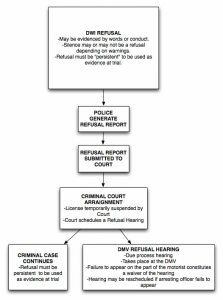 The following is a simplistic chart explaining the license suspension consequences of a person’s refusing to submit to a blood or breath test upon being arrested for driving while intoxicated (DWI) or driving under the influence of alcohol (DWAI) in New York. It is not legal advice. If you have been arrested for or charged with DWI, you should consult with experienced DWI attorneys in New York. What is Braylon Edwards Looking At in Manhattan Criminal Court? As just about everybody in New York knows, Jets wide receiver Braylon Edwards was arrested this morning. He was later arraigned in New York County Criminal Court and charged with the misdemeanor crime of Operating a Motor Vehicle While Under the Influence of Alcohol. The full text of the statute is below. Edwards was charged under section 1192.2 (a charge based on his blowing over a .08), 1192.3 (common-law DWI, which is often proves with such outward manifestations of intoxications such as red or bloodshot eyes, slurred speech, the scent of alcohol, unsteady walking, etc. ), and 1192.1 (a lesser included offense for driving under the influence, a violation not a crime). The New York County D.A.’s office will probably not make an “offer” to Edwards of a violation on account of the fact that his breath sample was over twice the legal limit (reportedly a .16) and the fact that Edwardsappears to have a criminal past. As of August 15, 2010, any and all motorists who are convicted of a misdemeanor DWI charge — even first time offenders — will be required to install an ignition interlock device on their vehicle. The ignition interlock device would force such a person to essentially pass a breathalyzer test every 10 minutes or so or risk an automated shut-down of his or her vehicle. It appears that at that point the device would generate an electronic report to the government, which would have to be reviewed by a person to determine what the next step must be in terms of reporting the matter to the court and to the sentencing judge. As reported in the Chenango Evening Sun, Chenango County believes that this review of the paperwork associated with the device will extremely time consuming and will stretch the county’s tight budget. The article in the Sun notes that some are calling the imposition of the device requirement an “unfunded mandate.” It remains to be seen whether New York City will experience a similar budget crunch when it comes to monitoring the device on a much larger scale. The section of the Leandra’s Law requiring the installation of ignition interlock devices for first time offenders will go into effect on August 15, 2010. The passage of Jack Shea’s Law will expand the list of technicians qualified to draw blood samples in order to determine an arrestees blood alcohol content. Another child-in-car Leandra’s Law arrest was effected in Plattsburgh, New York. Fourth of July DWI holiday arrests spiked this year.